Ask these questions and then sit back and listen. Think back to some of the best conversations you’ve had. Maybe a coming of age conversation with your mom or dad. Maybe the time you and your significant other sat all night just talking. Or with a best friend where you felt really relieved and at ease once the talking was through. Odds are pretty good that if you felt great about a conversation that the other person did a great job of not only listening, but asking you the right questions. If you want to be a better conversationalist you need to know how to ask the right questions. One of the keys is to make the other person feel important. You want to make them feel like you care. You want to find common ground between what they want to talk about and what you are curious about. Here are some key questions to help you get started. 1. How has work been? Most people like talking about their job. They’re either excited about something or they’re frustrated with something. It can be a challenge to listen to both. Don’t do that. Keep the focus on what the other person wants to discuss and dig deeper into their work. They might want to steer the conversation, but if you find yourself losing interest try to find an area you’re curious about. But it all starts with this question. But don’t let the conversation end there. People will get going the more you dig especially if they’re working on a certain project or a new piece of equipment or a million other things. 3. How has [insert hobby] been? Another key to good conversation is figuring out what people like to do for hobbies. It could be something that you know nothing about. And that can be a really good thing. You might be really curious about it. Check out the Geeking Out podcast with Kristian Bush. It’s amazing the things people are crazy about that are really interesting the more you listen to them discuss it. When you find passion you find conversation. Another question that digs deeper. Part of a great conversation is being interested. Getting more details. Sometimes the person will go off and ramble, but sometimes they’ll need a little nudging. You’re not trying to get them to ramble, but you do usually want them to open up a bit and this simple question can be the ticket. A very interesting question here. I’ve thought back to the good conversations I’ve had over the years and when I feel great afterward usually the other person has asked this question or something very similar. It does sound a little therapy-like, but maybe that’s why it works so well. Feelings make us human. 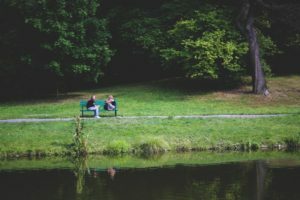 When we start discussing the way we feel about things it can really make for good conversation and good connections with others. 6. What new thing is holding your attention? Let’s say you’re struggling to find something to discuss. Work isn’t really working. Maybe it’s boring you. Maybe the hobby just isn’t clicking. Throw this question out there. Usually we’re all messing around with something. A new app. A new TV show. A new book. All kinds of things that are taking up our attention. It could be something with the family and kids. Maybe something a friend mentioned that the person is just getting interested in. This one could really go anywhere and that’s a good thing. 7. Has it always been that way? Let’s say the person has told you something about their job or their family or hobby or whatever. It seems like it has really struck a cord with them. Good or bad. This question will almost surely get them thinking. Getting people to dive a little deeper into what they’re talking about can leave an impression. You’d be surprised at how little we often know about ourselves. We don’t really ask ourselves this question very often. Not as often as we should. So it’s good if someone else asks us and gets us thinking and then discusses the topic with us. Do this with your friends. Maybe even your family and your spouse. It can lead to some great conversations. Try to keep the focus on them. You don’t want to interrupt and switch things over to you. 9. What are you struggling with? People seem to like to complain. Not everyone, but some people do. It doesn’t mean that the conversation can’t be something positive that leads to good takeaways. Ask this question. Be careful not to come out with advice. People aren’t always looking for advice. They’re often just looking for someone to listen and to hear them all the way out. So ask this question and sit back and listen. Don’t offer advice unless you’re sure they want it. This is one of my favorites. It could lead to discussion about family. A parent or aunt or uncle or grandparent or something. It could lead to someone in business or someone else, but it almost always leads to good conversation. Good conversations are difficult to come by these days. We often wish that others would listen to us, but we aren’t willing to do the listening ourselves. If you’re looking to connect with people you have to do more listening than talking. Use these questions to become a leader in the conversation field.